Early engagement and leadership is key when encouraging sustained business change. The online and ‘living’ version of Gippsland Water’s Strategic Asset Management Plan (SAMP Online) project demonstrated exemplar buy-in from an early stage and sought to trigger a step change in innovation and collaboration of business decision making. 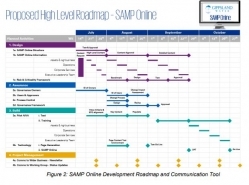 Initially piloted for the investment decision making process, the SAMP Online captured the imaginations of staff and explored how information sharing, stakeholder involvement and appropriate timing enables better decisions in an increasingly complex operating environment. This case study is designed to show case the benefits of engaging a wide cross-section of a water business. It demonstrates how senior management and strong governance can empower teams in making a sustained change.